(a) Transformation P is a reflection in the line x = m.
Transformation T is a translation ( 4 − 2 ) . Transformation R is a clockwise rotation of 90o about the centre (0, 4). 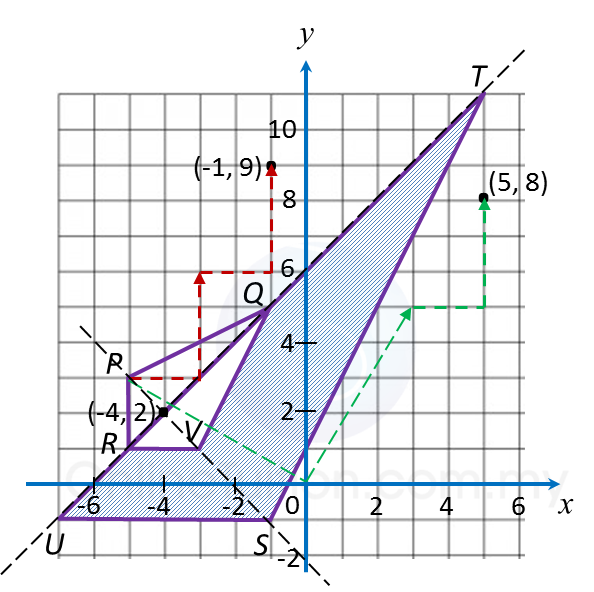 (i) The point (6, 4) is the image of the point ( –2, 4) under the transformation P.
State the value of m.
(b) Diagram below shows trapezium CDFE and trapezium HEFG drawn on a Cartesian plane. (i) HEFG is the image of CDEF under the combined transformation WU. (ii) It is given that CDEF represents a region of area 60 m2. U: An anticlockwise rotation of 90oabout the centre A (3, 3). W: An enlargement of scale factor 2 with centre B (3, 5). 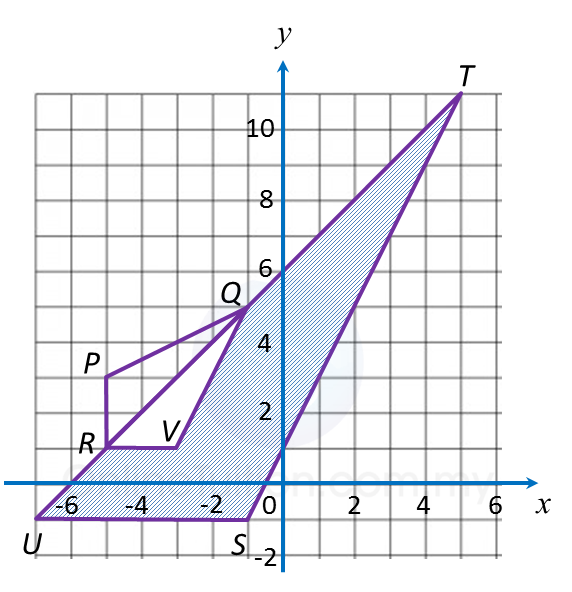 Diagram below shows three triangles RPQ, UST and RVQ, drawn on a Cartesian plane. (a) Transformation R is a rotation of 90o, clockwise about the centre O. Transformation T is a translation ( 2 3 ) . (i) Triangle UST is the image of triangle RPQ under the combined transformation VW. (ii) It is given that quadrilateral RPQ represents a region of area 15 m2. W: A reflection in the line URQT.